Whichever LSU fans created this anti-Alabama T-shirt succeeded in making it funny on multiple levels. The crude but clever punchline might elicit a chuckle. So too will the blatant grammatical error. It's probably a safe bet more Tigers fans would wear this shirt on Nov. 3 had its creators not mixed up "then" and "than" in an inopportune spot in the sentence. Fortunately, LSU supporters have plenty of other Crimson Tide-hating options, from a simple "Beat Bama" T-shirt to one that features a U.S. map missing the state of Alabama with a message underneath that reads "Imagine a world without Alabama." 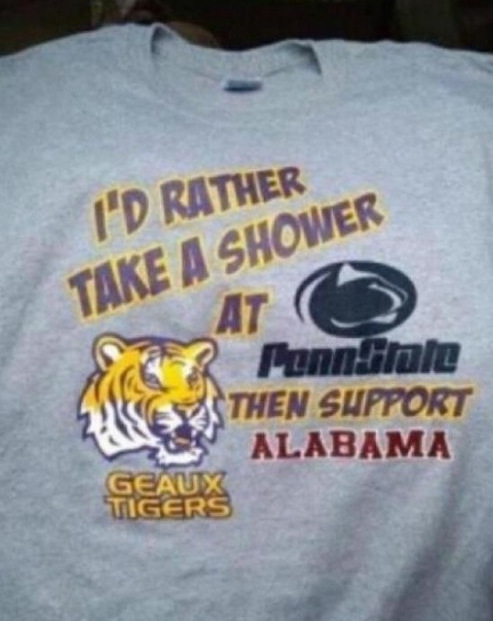 Of course, Alabama fans will be quick to point out they'd have the last laugh regardless of what shirts LSU fans wear as a result of the Tide's 21-0 victory in last year's national championship game. There's no T-shirt in the world better than bragging rights. LSU will have to wait until Nov. 3 to try to get that back.